We know the fitness industry is smothered with a dangerous blanket of myths and lies. Bulletproof Coffee is a multi-million pound business after all. Despite the fat loss arena being caked with these falsehoods, there may be some merit in adhering to the fabrications of yesteryear. We’re going to delve into some of the prominent myths surrounding the fitness industry and decipher whether they’re actually that bad. “Don’t eat after 6pm otherwise the food you consume will be stored as fat and you’ll end up looking like an oversized whale come the morning”. When you consume your calories is largely irrelevant when it comes to fat loss. What matters is your overall total calorie consumption throughout the day. 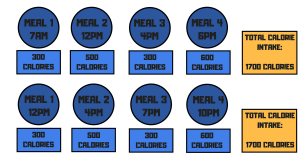 A calorie surplus will equate to fat gain, regardless of whether you eat at 12pm, 4pm, or 6.01pm. The belief that insulin – a highly anabolic storage hormone – will lead to fat storage while you sleep has been debunked; your body doesn’t dictate whether or not food is stored as fat or used for energy simply by the time of the day. Some studies have shown a fat loss advantage in those who eat earlier, others in those who eat later. Regardless, while the timing of your meals boils down to personal preference, it doesn’t particularly matter when you consume your calories. People like rules. Rules keep people in check when things are about to go haywire. Shortening the time available you’re ‘allowed’ to eat, therefore, means there’s less opportunity to consume unnecessary calories. It’s a common occurrence that as soon as those clock hands edge ever closer to bed time, people’s propensity for making sensible food decisions goes down the proverbial shitter. Boredom, stress, tiredness, and decision fatigue all come into play, as people find their hands sneaking into the biscuit tin – and other naughty places – the closer it gets to bed time. While your body doesn’t really care what time of day you eat, it’s your mind that will fail you. By setting the limit of not eating after ‘x’ o’clock, you’ll be doing yourself a favour. Having a hard and fast rule that you don’t consume food, or even enter the kitchen, after a certain time, could keep people in check when they start to feel a bit peckish post dinner. Those crappy food choices you find yourself making as you start to relax before bed won’t need to be fought with. 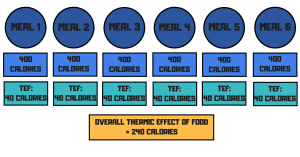 Our metabolism is made up of many factors, one of which is labelled the thermic effect of food (TEF). This means our body has to use energy, and calories, to release energy from food. It would make sense, therefore, to assume that eating more frequently would burn more calories over the day. 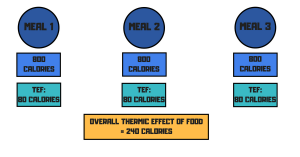 What this statement fails to take into account, however, is that the thermic effect of food is directly proportionate to the amount of nutrients and energy contained in any given meal. Winston, a staunch ‘six-meals’ a day supporter, consumes six meals a day, each equating to 400 calories. The thermic effect of consuming these meals would approximately be 40 calories burned – 240 calories for the day (6 x 40 = 240). David, a smart old chap who intently listens to his fat loss coach, sticks to his preferred three meals a day, each equating to 800 calories. The thermic effect of consuming these meals would approximately be 80 calories burned – 240 calories for the day (80 x 3 = 240). What do you know: The net effect on metabolism of both these meal frequencies is the same. In terms of ‘speeding up your metabolism’ an increased meal frequency has no effect whatsoever. Again, the main driver of fat loss is owing to an individual’s overall calorie intake throughout the day, regardless of how many meals they consume. People struggle with hunger while dieting. Eating more frequently, therefore, may be more beneficial for these types of people. Keeping hunger at bay throughout the day may allow people to keep their overall calorie consumption in check, as opposed to fighting their way through the mid-morning and afternoon lulls that often result in unnecessary snack feasting. In addition, snacking on high protein snacks, or other ‘beneficial’ foods, may allow people to hit a required macro target over a prolonged period of time, instead of having to shovel down a 200 gram chicken breast in one meal in order to meet a protein requirement. Whilst the frequency of your meals is irrelevant in terms of fat loss and stoking your metabolism, if consuming smaller, more recurrent meals throughout the day, while keeping overall calorie intake in check, works for your schedule and preferences, there’s nothing inherently wrong with it. “You must consume 20-25g of protein as soon as your workout finishes otherwise you’ll miss the ‘anabolic window’ and you won’t experience all those gainz”. It’s been a long held belief that protein consumption within a 30-45 minute window post workout is essential for the growth and repair of muscles; however, it’s recently been found that this may not be a myth so much as an exaggeration. Consuming 20-40 grams of protein immediately post workout isn’t absolutely necessary; what matters most is your total protein consumption over the course of a day. Add to that the widespread belief of an ‘anabolic window’ is largely owing to research showing that training is carried out in a fasted state, and you can see why racing to catch the magical protein synthesis train as soon as your last set has finished may not be as mandatory as first believed. Chugging down a post-workout shake and munching on a bland salmon fillet in this mysterious and enchanted ‘window of opportunity’ isn’t a prerequisite for building muscle. That window is actually much bigger than was first believed. Your next scheduled meal – whether it occurs immediately or 4-6 hours post exercise – is likely to be sufficient enough to keep those gainz. Habits are key to fat loss success. 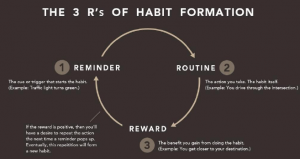 And these habits are formed on the premise of a ‘reminder, routine, reward’ cycle. For people who struggle to hit their protein, or even calorie, goals throughout the day, having the ‘trigger’ of a gym session in order to set off the pattern of downing a protein shake, or consuming a sufficient post workout meal, will ensure they won’t forget and will meet their requirements. There’s certainly nothing wrong with consuming a protein shake as soon as you leave the gym and if it means people are going to hit their daily protein requirements as a result, bashing this myth shouldn’t be your first port of call. The need to keep protein levels as high as possible is undisputed, and ensuring this is met, whether that be as a consequence of training or not, is compulsory. Having that gym session as your cue to consume some form of protein could well work in people’s favour. “Sugar is the devil and if you consume foods with sugar in them you will get fat and die and also it is the sole reason for obesity and why my mum hates me”. Sugar is not the sole reason for fat gain, nor the present obesity epidemic encircling the world. Stephen Guyenet, in his book ‘The Hungry Brain’, mapped out the relationship between sugar intake and obesity prevalence over the last 40 years. 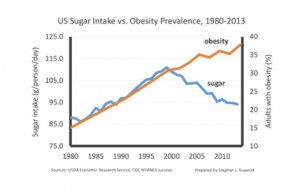 Despite sugar consumption and obesity levels steady escalating up to the year 2000, it’s clear to see since then, sugar intake has declined while obesity levels have continued to rise. It’s consistently been found that having sugar in your diet in itself is not bad for your physique or body composition. Many studies have compared groups eating a diet with the same macronutrient composition (% protein, % fat, % carbs) that differed only in which carb sources were consumed. The groups eating lots of sugar lost just as much fat without losing more muscle mass than the groups consuming little or no sugar. The belief that fructose – a sugar used for energy – causes fatty-liver disease, as well as insulin resistance and obesity, has also been refuted. And let’s not even get started on the premise that sugar is ‘addictive’. The big picture solution is in managing total caloric balance with a predominance of minimally refined foods and sufficient physical activity. As Alan Aragon says: ‘Pointing the finger at sugar while dismissing dosage and context is like saying that exercise should be avoided because it makes you fat and injured by spiking your appetite and hurting your joints’. Sugar isn’t bad; nor is it inherently good. If your overall diet is packed full of nutritious, protein-rich foods and you’re healthy and active, sugar won’t turn you into a walking sack of potatoes. However, limiting – but not exclusively depriving – sugar content from peoples’ diets may have some benefits to people’s fat loss endeavours. Generally speaking, foods ‘high in sugar’ also tend to be associated with additional higher levels of fat and salt; think cookies, cakes, pizza, doughnuts, chips etc. 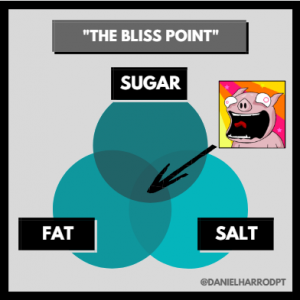 This perfect combination of sugar, fat, and salt is labelled ‘The Bliss Point’ and this sensory profile makes foods ‘hyper-palatable’ (also known as tasting freakin’ awesome), which urges you to want, and eat, more. The Bliss Point, which food companies are already striving to develop in their products, leads our brain to respond to a supposed ‘reward’ and drives us to consume more of that particular food. Not only are these foods more rewarding, but tend to contain more overall calories. By setting out to reduce sugar content, people will inadvertently reduce their consumption of these hyper-palatable foods, and therefore overall calorie content. It’s important to remember that no macronutrient, or particular food item within these groups, are the sole reason for fat gain, but reducing overall calorie consumption, as a result of setting out to reduce ‘sugary foods’ could work in people’s favour. Insulin is lowest in the morning – especially when we haven’t eaten in a while – and as fat oxidation happens at a faster rate when insulin is low, it’s sensible to believe that low intensity exercise will predominantly use fatty acids as an energy source. Unfortunately it isn’t a case of whether you’re in a fasted state or not; accelerated fat loss happens whether you’re in a calorie deficit or not. There’s no physiological evidence to suggest that fat loss magic occurs if you complete your cardio on an empty stomach. The principal factor is, again, your overall calorie consumption. Just like stating you don’t eat after a certain time, not eating before a certain time will inevitably decrease your eating window. Skipping breakfast to exercise doesn’t stir up a magical hex to burn extra body fat, it just means you’ll inadvertently decrease your calorie intake throughout the day. And as we know less calories will equate to more fat loss. Having the mindset of completing some form of exercise in the morning can also have its benefits; regardless of whether it enforces further fat loss or not. Finishing your exercise in the morning means people will be less likely to skip it later on, and the physical and mental endorphin rush from hitting the gym early on will help reduce the stress hormone cortisol and bring a fresh, positive outlook to the day. There are fat loss myths everywhere. Most lead people down the completely wrong rabbit hole when it comes to effectively trying to shed fat. They end up wasting time, money, and energy on futile activities pertaining to long-lasting fat loss. Some of these myths may not actually be that bad. Through inadvertently following the rules of some myths, people can still achieve the results they desire. May have some benefit to their long-term achievements. Hello, This is a lovely website, thank you for the detailed article. Have a nice day.